All advisors have some quality relationships with people who could open some great doors if they were asked effectively. Given that it’s virtually a free way to market, and given how much we love COI referrals (because now someone else is telling others to meet with us), why are our results often so weak? 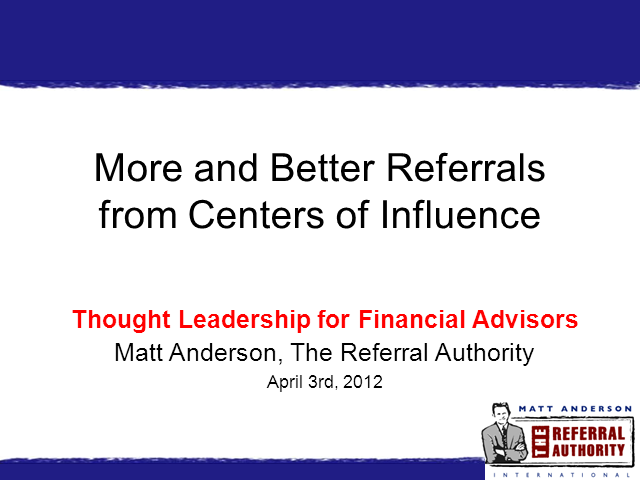 How do you tap into great referral opportunities from other professionals, friends and family, and/or top clients? There is a buzz around responsible investing and, as the market enjoys a creative phase, there are still tough questions to be answered along the path to mass adoption across the ecosystem. In this session, our panel of experts will share their take on the market outlook heading into the second quarter of 2018 with a focus on Environmental, Social And Governance (ESG), Socially responsible investing (SRI) and Impact Investing. Join this live Q&A panel session to engage with and hear from key industry experts with interesting and contrarian views on the market for responsible investments. “Doing well by doing good” is catchy, but it was often seen as a nice to have rather than a requirement. Sustainable Investing was a popular thing to say your firm does, but it was often seen as a “side dish” to real investments. This perception is changing, yet there is still work to be done. The challenge remains: How can ESG & Sustainable Investing create profit? This panel will features leading experts in ESG & Sustainable Investing that will explain why ESG & Sustainable Investing is profitable, share profitable strategies across asset classes, and explain how to implement at your organisation. This session will provide you with an appreciation of the history of ESG & Sustainable Investing, understand the challenges inherent in investing, and ideas on how to create profitable investment strategies. With ETFs continuing to grow in popularity, does Active Management have a place in the market? And, with so many proponents of Passive management, what are the contrarian voices saying? * How to blend ETFs in a passive portfolio? * How to use Equity ETFs as an active strategy? * Can Alpha be generated with Smart Beta ETFs by producing more than marginal returns? The flexibility of ETFs provides investors with the ability to gain exposure to a variety of asset classes and markets while controlling for market turbulence. What strategies are being employed, and what does the market look like now? This webinar will gather leaders in the field to discuss top level outlooks on the global economy, as well as deep dives into how ETF strategies are being used across asset classes and markets. · Examine recent legislative developments in a number of countries, most importantly Canada and the United States and the subsequent growth in demand. · Define key terms and important distinctions between medical and recreational cannabis. · Focus on the legalization of medical cannabis in a growing number of jurisdictions which has led pharmaceutical companies to invest in cannabis-based medicines, as well as alternatives based on synthetically produced cannabinoids. · Chart the growth of business opportunities across the full spectrum of the cannabis industry – both medical and recreational – including the tentative entry of big players into the market. Enhanced investor due diligence is required to address the legal, operational, financial and reputational risks the industry is facing – largely as a result of regulatory uncertainties and inconsistencies. We will examine some of the pitfalls of an industry in its infancy. Building retirement plans that can last a lifetime is the prize of every retirement planning professional and retiree. When retirement plans are “Built to Last”, longevity risk is the number one retirement risk for most retirees (especially when protecting two people for a lifetime). Retirement practitioners need to consider major risks associated with the distribution phase, different from the accumulation phase. Understanding what retirees want and what keeps them up at night are the major elements for financial professionals to resolve and solve for their pre-and-post retiree clients. It is important to build investment allocations that create a base of income that cannot be destroyed, one that cannot be outlived, and when done correctly, protect principal in the event of early death. Investing solutions should focus on income flow, discretionary liquidity, growth opportunities and legacy goals. During this session, we will address many myths and biases that surround these questions and show you how building a retirement income floor that incorporates insurance guarantees can help clients meet their emotional and financial needs for a lifetime. Despite the rise in interest rates of late, creating income from an investment portfolio to fund retirement is still challenging for most. The oft quoted standard of a 4% withdrawal rate has proven to be untenable, as well as not necessarily appropriate in every investor’s situation. For the best part of a decade, delivering income has been a battle. Low interest rates and bond yields have pushed investors to take greater risks to achieve high income. As US interest rates rise and bond yields spike higher, has the landscape changed? With cash potentially delivering an income in real terms, are we back to a more normal environment of bonds for income and equity for growth? What does this mean for portfolio positioning today? Tim Enneking, Founder of Crypto Asset Management. Most of us have heard about crypto “currencies”, ICOs and the tremendous volatility and risks involved. Is there any rationality in this space? Is there any room for a more traditional investor – or is investing in crypto anything but a crap shoot? The fact of the matter is that there is already quite a broad range of investments available in the crypto space, many of which carry far less risk and a far higher level of security than one might believe from general media reporting on the crypto sector. Timothy is the founder and the primary Principal of Crypto Asset Management, LP ("CAM"). Prior to founding CAM, Mr. Enneking was the founder and investment manager for the Crypto Currency Fund (“CCF”), one of the world's first private funds focused on cryptocurrencies. Prior to operating CCF, Mr. Enneking founded and managed Tera Capital Fund, a fund of funds focused on Eastern Europe (established in 2004). Simultaneously, in 2013, he was engaged to manage the world’s first Bitcoin fund. Mr. Enneking also has extensive M&A experience, having completed more than 70 transactions with an aggregate transaction value of over US$12 billion. He speaks near-native French and Russian, as well as German. He has five university degrees, all in international business and law. While the U.S. economy remains on solid footing, exogenous risks threaten asset values, market confidence, and the strength of the U.S. economy. The Fixed-Income Outlook webcast features Guggenheim Investments’ Bill Costigan, Director, Portfolio Management. * What are risks of a full-blown trade war? * Is Fed policy heading into restrictive territory? * What fundamental concerns are rising in credit markets? * Will investor confusion prevail as the mid-2018 theme? The world is changing and whilst you're reading this; the speed of change is increasing even further. What this leads to no one knows - the future of financial services could be "anxious and challenging" or "brilliant and full of opportunities". Will customer centricity still be the mindset? What about “AI-first”? Or will we jump into the next phase of life? Join this session and start tomorrow's conversation today. Ziad of Blackhawk Partners talks about how the Trump Administration is Affecting Global Market, foreign policy, tax, trade, and much more. James is a globally recognised expert and innovator, published author on the innovation agenda and expert marketer and business strategist. He runs Springwise, which he founded as an incubation and analysis platform for great innovation agenda themes and ideas, and also is a serial adviser to notable organisations on innovation and evolving strategy, not least Capital D – a Pan European Private Equity Fund. Legacy is a key for Ultra High Net Worth and as such Family offices are increasingly seeking purpose and lasting impact in their investments. What initiatives exist that HNW & UHNW can get behind? Once identified, how can they start an initiative and ensure that it has a lasting impact? You'll leave this webinar with an understanding of who the players are, what they are doing. Global capital and traditional banking has ignored the whole SME space. Incidentally, this SME space may have the biggest social impact if it could be better financed. There is huge opportunity if investors know where to look. This webinar will discuss the how and why this market has opened up, who is involved, and where you can go to find the deals. The US Financial Advisors Channel provides Registered Investment Advisors (RIA) and fee-only financial advisors with practice management insights. You can find industry luminaries presenting weekly webinars on topics such as social media, marketing, referrals, engaging the affluent, compliance, life planning, retirement planning, and succession planning. You can attend the webinars at no cost and will be able to submit real-time questions to presenters during the live online events. If you are unable to attend a webinar live, you can also view it afterward on demand.